OK, here's a quick project that will definitely add the geek look to your wardrobe. You will need only a few items and about 15 minutes of time. Get a military type belt buckle, the kind that you feed the belt end thru and is kept in place by a small sliding mechanism. If you don't already have one somewhere, find one in a budget store, usually with a canvas belt attached for a few dollars. 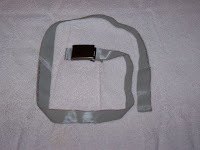 For your belt you will also need enough 25 conductor ribbon cable to wrap around your middle, plus a little extra. Use an old belt that you might have that fits to get a correct length and cut your ribbon cable to that length plus and additional 10 inches. You can buy this cable by the foot or spool, in a standard gray color, and sometimes a rainbow color scheme at most computer or electronic supply stores. If you are truly a geek you have some on hand already! After you cut your ribbon cable to the correct length, fold about 3 inches of one end back over on itself. This is the end you will place the buckle on. These military type buckles have a small toothed clamp on the underside that secures the buckle to the belt. Feed the folded end of your ribbon cable in to this clamp and extending to about the end of the buckle. Clamp the buckle to the cable. 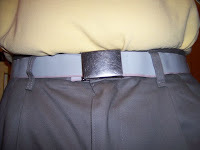 Now test your new belt for fit by folding the other end upon itself and inserting into the buckle. In the case its to long, just trim the free end with a good pair of shears. If its to short, unclamp the buckle for the belt and shorten the folded area and re-clamp the buckle.